As autumn is still here holding off the winter weather, I managed to get out on a couple of local routes, as the title says, from our door. 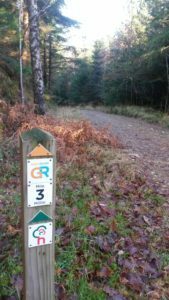 These routes are great examples of the excellent mountain biking and trail running here at Coed y Brenin. 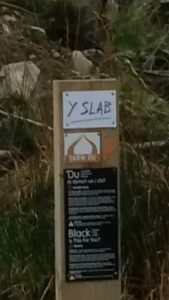 First up was a ride on the Tarw Du, to check out the new section, Y Slab . A quick spin round to the Coed y Brenin Visitors Centre to warm up, then straight onto the mountain bike trail. A bit of a climb up, with views of the snow topped mountains letting me know winter is out there making the ride pass easily, then onto the new section.A midweek ride in November means you might get the trails to yourself, which helped with stopping to take photos whilst finding my bottle to ride the slabs. 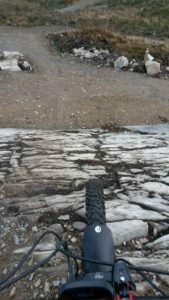 A brilliant section, with a number of slabs, with the links to ride back round easily for another go, which I am sure people will do time and time again. They look a bit intimidating from the top, especially to a wheels on the ground type rider as I am, but they deliver a fantastic adrenaline rush. I am not the greatest technical rider around, and I managed to ride them all with a bit of scoping out of lines first. With the slabs rightly getting all the attention, there is little mention of the single track after them, but this is another excellent section that will get better as it matures into the landscape. Next up (on another day) was a trail run around the Goldrush Trail. I have run sections of this 8.5 mile route quite a few times since the move here, so thought it was time to cover the whole route in one go. With a heavy frost lingering on the shaded side of the valley adding to the effects of the sunshine coming through the trees, it was a beautiful morning for a run. Running from our door, the trail is only 200m away so easy to find and follow. A great route, with some brilliant technical sections and some fast sections giving a good mix of running. The route details can be found here. This was the longest run I had done for a while, so as always I was pleased to see the view from the bottom of our drive!